"The Loss of One of the Key Architects of Victory"
It would be very difficult, if not impossible, to analyze the news in the usual fashion tonight. The tragic news from Warm Springs has stunned the world so, with its shocking suddenness, that nations, and the men and women who make up the nations, must take time to catch their breath. The tributes, the words of grief and affection and respect, are pouring out of the world's most important cities and into Washington. There are millions everywhere from whom no words are expected; millions whose names are not newsworthy and whose tribute of sorrow will be given in silence, away from the glare of public events. Those whose position makes fitting a public expression have found the words, or are finding them, tonight. The shock has been sudden. But it is possible now to find the right words to say, and the right things to do. There has been time, during this long evening, to think of what the President's death means tonight. But there has not been time to think what it will mean in the days ahead. Franklin Roosevelt was a battle casualty. He died during the war; and he died in the war. Even had he been spared to witness the great victory, to which he has given so much, his death—later, after the last shot had been fired—would still have been a war death. For he did give much of himself; he contributed immeasurably to the triumph that is coming, and in doing so he gave the most that any man can give. Most battle casualties are sudden and shocking. They leave a space which seems particularly tragic because it was unforeseen. It is human nature, among the great and famous as well as the unknown, to avoid considering a terrible loss that may happen as long as there is a reasonable chance that it will not. It would be too much to expect that the President's colleagues among the Allied nations—such men as Winston Churchill or Joseph Stalin—have planned the actions they must take, or have thought long and consistently of what the death of Franklin Roosevelt will mean. And it would be equally unwise to fear that, now that the blow has come, the responsible men will find it difficult to meet the situation that results from the loss of one of the key architects of victory and what is to come after victory. The Allied nations are strong, stronger than any who have dared stand against them. The Allied power comes from many sources, but most of all from the millions who were plunged into mourning late this afternoon. The pause that has come—the hesitation—is an interval necessary when the mind has been shocked and the breath must be caught. There has not been time to think. The news is known but the brain does not quite grasp it. There is knowledge that, in the days to come, the loss will be felt often at various turns in the road. The mind knows that—for that is the way of death—but the mind does not wish to consider it in all its implications. Not yet. In the future, tomorrow; not tonight. From strange countries faraway, and from our closer allies, and from the cities and villages of our own United States, the news tonight is the same, though it is written in different words. Everywhere, men at first say, "No, it is not true. I do not believe it. It could not happen now. Not now." That is the thought of men who drive taxicabs and sit in offices and teach in classrooms and farm the earth. It is the thought, too, of reporters, who are supposed to be toughened against news of disaster and pain. There are many reporters who have been writing and speaking this news for more than five hours now, who have not had the leisure in which to stop and think. When this night's work has been done, to many the notion will come; it has not happened, it cannot be true. The thoughts and feelings of reporters are not so different from the mental processes of the men who drive the taxicabs and the women who cook in kitchens. The minds of statesmen and generals also react in a similar fashion when confronted with tragedy. It would be too much, then, to expect the men who are now responsible for the victory and what will come later to think deeply tonight of the meaning of April the twelfth, 1945. And it would be too little to expect anything less than the victorious alliance will roll on—in war and peace—on the battlefields and in the conference rooms at San Francisco. For a great man is dead, but the strength of the millions who mourn is enduring. DOUG EDWARDS: And now for the report of Richard Hottelet of CBS. Go ahead, London. RICHARD C. HOTTELET: This is Richard C. Hottelet speaking from London. The Allied forces landed in France early this morning. I watched the first landing barges hit the beach exactly on the minute of H-Hour. I was in a Ninth Air Force Marauder flying at 4500 feet along twenty miles of the invasion coast. From what I could see during those first few minutes, there was nothing stopping the assault parties from getting ashore. We spent about half an hour over enemy territory. We flew over and bombed some of the coastal fortifications, but except for some light flak from inland positions and from some tanks firing at us, we saw no enemy gunfire. The only other sign of life in enemy territory were some white and yellow parachutes dotting the ground, where all our paratroopers had hit the ground. The weather is favorable for the operation. Offshore, Allied warships were bombing the enemy coast, and they seemed to be doing it without any opposition. As far as we were concerned, there was no opposition from the air, either. The Luftwaffe just didn't seem to be there. What I saw was literally the last minute of the invasion preparation and the first minute of invasion. We were low, but we were traveling fast, and we could not tell how the battle for the beaches would develop. But if the ground action goes as smoothly as the air preparation, we can hope for the best. I went in with a bomber group—probably the hottest group in the Ninth Air Force. Our mission was to plaster the invasion beach and some coastal fortifications with bombs seven minutes before our assault parties came ashore. This group was chosen for the hair-trigger work because of its previous superb record. Well, we delivered, and we delivered on time. This is the way it worked. Last night we were told briefing would be at 3 o'clock. We got up at 2, had griddle cakes and fried spam for breakfast, went into the Nissen hut that serves as a briefing room. The doors were closed, and the commanding officer announced that the invasion had begun. 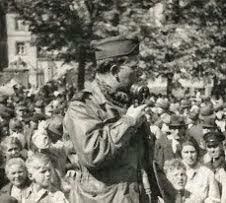 He said that, since midnight three hours before, our paratroopers—some 20,000 of them—had been landing in France. The men cheered. The colonel went on to say that the air forces were being called upon for their maximum contribution. There were going to be more than 1500 Fortresses and Liberators flying ahead of us. Hundreds of medium bombers, too, were going to precede us, and our group was to wind up the pre-invasion bombing. When he said this, the men really cheered. To top it off, we were going to have cover from more than 2500 Allied fighters. The colonel made it plain that nothing was to be left to chance. The weather in the target area had been unsettled and cloudy, and as we were going to deliver precision bombing, we would have to fly below the clouds, and then we would go down and bomb from a thousand feet. When he said that, not a man blinked an eye, despite the fact that such a low altitude counts as suicide for the Marauders. It was still dark when we took off, and raining. But one by one, those Marauders roared down the runway and took off. An hour and a half later we were out over the English Channel. First we couldn't see anything except a few stray vessels. Great care had been taken to keep our ships from firing at their own planes. Every single bomber and fighter had been painted overnight with special markings on wings and fuselage, and the direction we were to fly, the way we were to turn if we got into trouble, and the recognition signals we were to give, had all been very carefully worked out. Even so, when we passed over the first few barges, we had the uncomfortable feeling that we were being shot at. It didn't last long. We were out of the way in a matter of minutes. By this time it was getting on, and the sun was painting the sky a bright orange color on our left. Below us, the English Channel was a fine, deep blue. There were a few whitecaps, but we got the impression that it wasn't very rough down below. About five miles off the French coast, we saw a plane in a steep dive laying a smokescreen. Just about the same minute, the pilot said he saw fires on the shore. I looked as hard as I could, and there down to the left were some naval vessels. They looked like cruisers firing broadsides onto the shore. Their guns belched flame and smoke. Once, I saw a fountain of water not far from one of them, which may have been a shot from the shore or a death charge. Near the cruisers were dozens of landing craft of all kinds, hardly visible in the early morning haze. All this while, we saw medium bombers and fighters crisscrossing on the way to the target without a sign of a German plane. Then, as we turned in over the coast about ten minutes before H-Hour, we saw a fast assault boat race along parallel to the beach laying a smokescreen. From the way the screen laid, smooth and even, it looked as if there were no wind. We opened our bomb bay doors. Light flak began to come up after us; little balls of fire off to our right and to our left. Some heavy flak off to our left, not near at all, firing only sporadically. The flights ahead of us dropped their bombs. The guns on the ships offshore resumed fire. The bombs and the shells burst together on the target. There were sheets of flame down below, then rolling balls of brown and black smoke. Four and a half thousand feet up, our plane was rocked by the concussion, and we got the stench of the explosives. We dropped our bombs as scheduled. And just then, we saw down below on our left dozens and scores of white streaks as the assault boats raced over the blue water to the beach, leaving their white wakes stretched out behind them. As we turned away from the target, we saw the boats hit the beach. Then we took evasive action—I couldn't see anymore. Down below, except for some more sporadic flak, it was a dead country. No sign of life. No vehicles on roads; no troop movement. And all the way in, we saw our Marauders weaving in and out in perfect formation above us, below us, and around us on all sides. We didn't see a single one of our planes in distress. The mission wasn't the way we had figured it. We had expected to see German fortifications give back blow for blow with our ships. There was no sign of it. We had expected to see the Luftwaffe out in its full remaining strength to try to stop our planes, or at least strike a blow against our landing craft. We didn't see either. We had expected to find enemy territory full of antiaircraft, alive with reserves moving into threatened areas. We didn't see that. The circumstances of our flight, the fact that we got there simultaneously with the invading troops and left in a minute, make it impossible to draw any far reaching conclusions on how the battle is going. But one thing we can say already, and that is: our air supremacy over the coastal invasion zone today is not seriously challenged. I return you now to the United States. EDWARD R. MURROW (from London): This is London. Late on the afternoon of D-Day, Charles Collingwood took his recording gear in a little 36-foot LCVP onto a French beach. Nearing the beach, the water was filled with floating objects. Part of a parachute; a K-ration box; a life jacket; wreckage from a ship; shell cases. Here is part of the recording. CHARLES COLLINGWOOD: This is Charles Collingwood. We are on the beach today on D-Day. We've just come in. We caught a ride in a small boat which came in from our LST loaded with a thousand pounds of TNT, half a ton of high explosives on this beach which is still under considerable enemy gunfire. While we have been here we have just seen one of the strangest and most remarkable sights of this invasion so far. Two great fleets of over a hundred gliders have gone overhead towed by C-47 transports, who are certainly proving the workhorses of this invasion. They've hauled them right over the beaches and it seems as though the German gunners, amazed at this incredible sight, have stopped firing on the beach now because it's quiet here, and the second batch are droning over now. I can see them. They're casting off the gliders as they circle around over the beach and the transports are circling around and beginning to make off home. Where they're landing we don't know because we're down here on the beach, and there's a seawall in front of us and we can't see the land behind. This is the way the beach looks, which was hit by our troops about twelve hours ago early this morning. It's a flat, sandy beach, like almost any beach that you're likely to see, and it floats gently away from the shore—from the seashore up to the dunes and then to the seawall, which was the first objective of our troops and which they took early on in the game. Since that time, we have been able to bring in quite a bit of equipment. There are various trucks and jeeps and motor vehicles of all kinds here. There are also antiaircraft guns. We breached the seawall in various places and have set up guns there to defend against any possible enemy counterattack on the beaches, which has not occurred. A naval party has just come in from the shore and begun to unload our TNT here, which is taking a load off my mind as well as a load off this vessel. And I asked him how things were going and he said it was pretty rough still. I asked him how far the troops had gone on inshore and he said that they'd got five or six miles inshore, which sounds as though they're making good progress. He said that the beach was still under considerable gunfire. The Germans had some 88s which we haven't been able to silence. These boys are apparently having a pretty tough time in here on the beaches. It's not very pleasant. It's exposed, and it must have been a rugged fight to get it—although as nearly as we can see there is not a great deal of evidence of damage. Perhaps that's because it has been smoothed up. We can look along down the coast now and see this flat part of the beach which joins the water, going all the way down to the lower beach which is marked for us by columns of white smoke which are arising from it. And further up at the end of this beach we can see another huge column of white smoke which has apparently been caused by naval gunfire. Looking out to sea, all we can see of the vast invasion fleet which is assembled for us are the silhouettes of the big warships, the battleships, and cruisers which have been putting a steady bombardment against the enemy positions all day. We can also see a few of the transports, but the fleet of LCTs and LCIs and other craft, which we have brought and assembled back maybe ten miles offshore, is invisible from us at this moment. They're coming back now, taking off more and more of this ammunition. We've got a captain here who has come by and is looking rather curiously at this gadget we've got. Captain, can you come over here a minute? Can you tell us how things are on the beaches? LIEUTENANT: Thank you for "captain," but actually I'm a naval lieutenant. Sometimes we get on these beaches by—we get to look like all kinds of things, particularly after you take a few running jumps in the sand. COLLINGWOOD: Well Lieutenant, what's your name? LIEUTENANT: So that—or I did and I don't think I wanna ruin your broadcast. Let's just—let's say we dropped in, and that alone. COLLINGWOOD: Okay, well, how are things going on the beach there? LIEUTENANT: I've only been in for a little while, while these other boys have been there all day and if you might have made—maybe an army word, it's "rugged" as a matter of fact. COLLINGWOOD: Is the beach still under some enemy shellfire? LIEUTENANT: The beach is being pounded by enemy shellfire, though we hope to have it knocked out in the near future. COLLINGWOOD: Boy, those gliders that just went over were quite a sight, weren't they? LIEUTENANT: That was an impressive thing. I think that all of you folks listening at home, if you could've heard the "oohs" and "aahs" from men who are really dug in the shell holes in the sand—if you had heard those it would've done your heart a lot of good. It certainly did mine to see them go by. COLLINGWOOD: Well I can agree with that too because it was a very impressive sight. And now looking out we can see them going back very low along the water. The C-47s—which brought the gliders in—they've cut loose. And here comes another flight. The third flight of gliders which is being pulled in. I can't tell how many of them there are. They're coming in over the beach here. Squadron upon squadron of them have lined up in perfect formation, with the gliders coming along behind the big C-47s, and they're coming in apparently to drop right where they dropped before. Further up the beach, there's a fire which has apparently just been started by enemy shelling. It's maybe a quarter of a mile up from us. At the moment there's no shelling in our immediate vicinity, although when we first beached our little LCVP about a hundred yards down the beach, German 88s were kicking up big clouds of sand as they shelled our positions down there, and you can still see some smoke drifting off from it. And over to our left, there's what is left some small craft or other which has been hit and is burning. A great big Rhino ferry is making its way into the beach loaded with every kind of vehicle and craft. I can make out jeeps and trucks on it, and men sitting up there manning their guns which are already in case of enemy air attack. But there is no enemy air to be seen anywhere around here. The sky however is filled with this third fleet of gliders which are coming in full of our airborne infantry. There is something which just dropped into the ground—into the sea. I don't know whether it was a plane or what it was that it made a big splash up there as it dropped down from out of the sky. The gliders are coming in now hauled in by the C-47s and protected by fighters which are around there. I can make out Thunderbolts and Spitfires which are giving them cover, and they've just taken off the last of our thousand pounds of high explosives, which is making it considerably more pleasant on this little boat. They're having to wade in across maybe fifty yards of water to get it into the beach. We've come in in this LCVP through the transport area where our ship is. It's taken us about two hours to get in, and we came in through the choppy seas, with every second wave breaking over the ship and dousing us with spray. Gene Ryder and I are—and everyone on this little boat—are soaked absolutely to the skin. We're wet through and through. The salt is caked in our eyebrows. Every time we lick our lips we taste the salt. Our hands are cold and chapped as... We just found ourselves lucky that, after having made a trip like that, we don't have to go onto the beaches and fight. All we have to do is make the trip again. GENE RYDER: I might tell the Navy Department we owe them one recorder. COLLINGWOOD: Gene is referring to the fact that we took our recording machine which the Navy has lent us along with us here, and it has been absolutely inundated with the spray. Somehow or other Gene has made it work. I don't know what—he was out there polishing it with his handkerchief. Gene says he doesn't know how he made it work either. And looking back now, turning around with my back to the beach and looking out to the sea, more and more and more of these glider-borne troops are coming in. These gliders are coming in towed very slowly by the big C-47s in what is apparently an unending stream. It's an incredible sight. And as that navy lieutenant told us a moment ago, the troops are waving and pointing and talking about it on the shore, at least those of them who have time and are not too busy taking care of themselves. The troops are well dug in here along the seawall which is partly covered by sand. They're sitting down now, most of them dug deep into the ground as close as they can to the seawall to protect themselves from the enemy shelling. Some men are lining up further down the beach near a sign which says "five." They are taking over a truck and are apparently about to move off, whether through a breach into the seawall back inland or not, one can't tell. We're standing here—it's an absolutely incredible and fantastic sight. I don't know whether it's possible to describe it to you or not. It's late in the afternoon. The sun is going down. The sea is choppy and the beach is lined with men and materiel and guns, trucks, vehicles of all kinds. On either side of us there are pillars of smoke perhaps a mile, two miles away, which are rising from enemy shelling. And further back we can see the smoke and results of our own shelling. Looking behind us we can see the big ships and the—some of the transports which have brought the troops in. And overhead this incredible sight is still going on as more and more gliders are towed in by the C-47s going over the seawall, disappearing out of sight in apparently a wide sweep, and dropping their men somewhere back there who—for a function which we don't know anything about. All we can do is stand here and marvel at the spectacle. Now our men—we're trying to get the LCVP in closer to pick up the men who have been waiting ashore in this cold sea and choppy wind to pick up the stuff. This place even smells like an invasion. It has a curious odor which we all associate with modern war. It's a smell of oil and high explosives and burning things. All—thank you. Come on over here! [Inaudible], who is one of the sailors, has just come with a handful of sand because he heard me say a while ago that what I wanted to do most of all was just to get ashore and reach down and take up a handful of sand and say "This is France!" and I've got it in my hands. France at last, after four years. [Inaudible], how does it feel just to reach down and grab a piece of sand and say "I'm grabbing French soil," huh? SAILOR: Well it's—since I was born in France it has special meaning to me. COLLINGWOOD: Were you born in France? COLLINGWOOD: Where were you born? COLLINGWOOD: You were? Well that's not very far from here. Well it has a special meaning for me too, as you can imagine. Have you got some? We've gotta save this. We've gotta put it in a bottle or something. Now the transport planes are going back. The C-47s who came in towing the gliders, they're going back very close to the sea and we're going back too. We've got our men aboard all with handfuls of France in their hands, and we're going to save it because this has been a momentous occasion for all of us. There go our motors. The ramp is going up. We're backing away from the beach now, and soon we'll be out in the salt spray and it'll be impossible for us to broadcast anymore. MURROW: That was a recording made by Charles Collingwood at a French beach on the afternoon of D-Day. We return you now to the United States. ROBERT TROUT: And now we've just had word that we're to hear further news direct from overseas. And so for another report of the pooled broadcasts, we take you now to London for the report of CBS correspondent Charles Shaw. Go ahead, London. CHARLES SHAW: This is Charles Shaw in London. For an hour after the broadcast of Communiqué Number One [audio], I played town crier to a London generally unaware that France had been invaded. I rode and walked through the strand—Fleet Street, past St. Paul's, along the Thames embankment to the Houses of Parliament and Westminster Abbey, out to Piccadilly Circus and other parts of so-called downtown London—asking people here and there what they thought of the news. In most cases I found out that I had to report the news before getting any comment. It looked like London any morning between 9:30 and 10:30. The streets comparatively deserted, soldiers of all nations dancing about, street cleaners running their brushes along the curbs. I asked a taxi driver to take me around the city because I wanted to see how people were reacting to the news. Incidentally, I asked him, "Have you heard the news?" "I heard something about it," he said, "But I don't know whether it's official." I assured him it was, because I had just returned from the studio where the communiqué was broadcast. Waiting for a traffic light, we drew alongside a car driven by a girl wearing the uniform of France. I leaned out and said, "What do you think of the news?" "The Allies have landed in France." All she said was, "Thank God." Fleet Street, headquarters of the press in London, was normal. A couple of men who might have been reporters were seen dashing into buildings and up to St. Paul's Cathedral to see whether there were worshipers inside. And the only person in the vast auditorium was a black robed guide to the crypt who hadn't heard the news. His comment after being informed was, "That's good." And so it was all over London. Two RAF sergeants were sightseeing in Westminster Abbey. A couple of women were trying unsuccessfully to gain entrance to the Houses of Parliament. Downing Street was empty except for a street cleaner almost in front of Number 10. All over London women were selling flags for the benefit of the Red Cross. The girl I patronized hadn't heard the news, and her expression changed little when she was informed. The next interviewee was a roly-poly woman, dressed about as broad as she was long, who had heard the broadcast. "It's gewd," she said. Not a newspaper extra appeared on the street. London this morning, for at least an hour after the broadcast of Communiqué Number One, was the same London that it was yesterday morning. Earlier this morning, the telephone rang at 7 AM. It was Ed Murrow. He said, "Better get dressed and wait for a call from me." A new world speed record for getting dressed was promptly set. The dressing was accomplished against a background of heavy sky noise, the sound of great fleets of planes. They were too high to be seen, but their roar seemed to fill the sky, and the planes seemed to be everywhere. At 7:45 the phone rang again. "Get to such and such a building as quickly as possible." It was a building from which the big communiqué was to be issued. It was going-to-work time for London, and masses of shopgirls and businessmen jammed the sidewalks leading to that building. Almost bursting with what I felt was the big secret, I studied the faces of those people. Their expressions were the same as those of going-to-work people all over the world. Most of them looked sleepy. Quite a few of the girls were white-lipped, apparently having got up too late to put on lipstick and intending to do so at their offices. Some were neatly dressed, others had ties askew just like the eight o'clock crowd in Pittsburgh or San Francisco. But there was one difference. 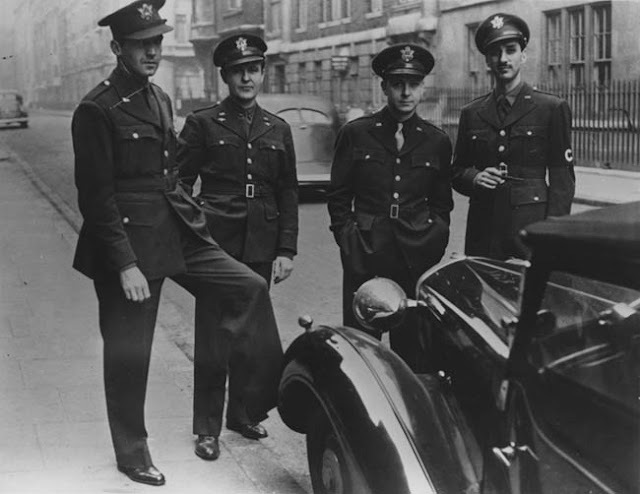 The clothes they wore neatly or carelessly were mostly of 1939 and 1940 vintage. The lipstick the girls wore or forgot to wear was of a hard, chalky substance—war stuff. The tiredness in their faces came not from a bad night, but from almost five years of working in the front lines of war. You felt like shouting to those weary people, "It happened! The invasion has started!" Because that's what these people have been working and fighting for; fighting beside antiaircraft guns, fighting with fire hoses, fighting with industrial tools since one day exactly four years ago when the tattered fugitives from Dunkirk reached these shores. In a few hours they would know, and you wondered how they would take it. The building was reached, and the way correspondents were converging on the gates from all directions reminded you of the old Toonerville Trolley animated cartoons in which an incomprehensible number of people would enter small apertures. They were all hurrying; some of them just moved their legs faster without seeming to cover much more ground. Practically every pass that you've been issued since arriving in London had to be produced. No one-eyed Connellys could get in here. Bureau chiefs were herded into one big room. One person from each press association, major newspaper, and broadcasting network. All others were barred. And downstairs, outside of news special studios, the other broadcasters were waiting and typing out last minute pieces. And one of those studios had been locked tightly since its construction was completed. That was the studio that which the communiqué was to be read to a waiting world. Already the German radio was broadcasting reports of fighting in France. London was maintaining silence. The broadcaster's workroom was filling with colonels, majors, lieutenants, and GIs of both the American and British armies. Nobody seemed quite sure of what so many soldiers were supposed to do in so small a room. White legging-ed, white belted MPs, their garrison caps banded with what looked like white bandages, took spaces inside and outside the doors. In came the official Allied spokesman with retinue. He began calling New York network headquarters, informing them that the first communiqué would be broadcast at 9:32 London Time. 9:32 arrived. The communiqué was broadcast. The big secret was out. This is Charles Shaw in London returning you to New York. BILL DOWNS "SOMEWHERE IN NORMANDY"
BILL DOWNS: I'm speaking to you from a tent somewhere in Normandy—that bit of a truly free France liberated eight days ago by the invasion of British, Canadian, and American troops. It is 6:30 AM over here—the ninth day of the invasion is only a few hours old. If you hear strange noises during this broadcast, it's the RAF and the Allied air forces and the American air forces on dawn patrol. It's more than dawn patrol—it's dawn attack. I could take you right now in a thirty minute Jeep ride to where the Allied troops are fighting. You can get to some part of the front in thirty minutes no matter where you happen to be. So much has happened in these past eight days that they seem like eight months to every one of us over here. Americans have died, and British and Canadians have died—and a very great number of Germans have died. But the Allied forces have achieved what Hitler's henchmen said was impossible. We are in Europe to stay—and you only have to look at the face of an American doughboy, or into the eyes of a man from Calgary or from London, to know that we're not going to stop until we have completed the job. All this comes under the category of making history. The news from the front this morning is good. As a matter of fact, we've no bad news to report since the Allied forces crossed the beaches. On the American sectors of the front, the troops continue to widen the bulge, threatening the entire peninsula of Cherbourg. The British-Canadian sector likewise is slowly expanding. There are hold-ups at a village here or there which the Germans have strongly fortified. There has not been much forward movement [around the city of Caen on the left flank of the] beachhead. But you might compare this bit of liberated France to a giant muscle, which daily is becoming stronger and stronger as the sinews of war pour into it. As more tanks and guns and men pour in, the muscle expands. Thus far the Germans have been unable to do much about it. However, last night and today there are signs that the Nazi high command has finally been able to get some fresh troops into the line. The fact that it took a week for his first reinforcements to arrive speaks for itself as to the effectiveness of the Allied night and day bombing over the past few months. But as the Germans reinforce—and we are reinforced—there can be little doubt that a big battle is developing. In this sense, the Battle of France is a race between supply systems of the opposing armies. The force that gains superiority first will strike. You'll be interested to know that our supply position is all right. I have heard so many stories of gallantry and pure guts since I arrived here that it is difficult for me to begin to tell them. Heroes are not uncommon on this beachhead. I was lucky in my own personal invasion of France. I came in on a comparatively quiet sector. As General Montgomery has announced, the battle for the beaches has been won. Sometime when we're not so busy, history will record the battle of the Commandos who landed behind the German defenses and so disrupted the Nazis that they were firing at each other. Or of the Canadians who walked point blank into German shellfire to silence these batteries. And the most glorious single action of the whole invasion was performed by the American assault force. They clung to their position literally by their fingernails. They fought as no Americans have ever fought before. They were outnumbered; out-gunned with odds twenty to one against them. They took their position coming through a wall of shrapnel, mortar fire, and machine gun bullets that was terrifying. The casualties were high—higher than on any other salient. ROBERT TROUT: And now Admiral takes you direct to the invasion beachhead in France, Larry LeSueur reporting. LARRY LESUEUR: This is Larry LeSueur speaking from the American sector of the Normandy battlefront. Tonight the American troops hold the entire neck of the Cherbourg Peninsula firmly in their grip. The picturesque little town of Bonneville on the western side of the peninsula has been captured, and we are now astride every road leading to Cherbourg. Thus the big French port, with its large garrisons, is cut off from the German Army in the interior of France. Although today is D-Day plus thirteen, the boys who are up on the front lines still find themselves talking about their adventures on D-Day whenever they get a chance to smoke a cigarette. My experience was similar to that of many of the men in the 4th Division who made the assault on our beach. The 4th Division has the enviable record of being the last American division to leave Germany after the occupation in the last war, and it was chosen to be one of the first American divisions to land on the continent. It was very rough on the Channel, and after hours of seasickness we all felt pretty gloomy. Most of us had spent the time resting in our soaking wet [inaudible] waves had crossed over the sides of our little landing craft. But after a sleepless night, D-Day dawned. And we tramped forth from our barge towards tiny personnel assault craft. And with the regimental combat team, we began a rough ride into the beach. It was a fantastic sight. We could see great geysers of sand shooting up from the beachhead as our planes drenched the area with bombs in great green and yellow flashes. Every time a salvo of bombs hit the beach, our assault craft seemed to bounce back about ten feet. We were the first regimental command post to make the landing. I don't remember wading ashore—I think I must have just skipped in to get my feet on the ground. Every one of us felt the same way. We didn't care what happened to us as long as we could get off that bucking, bouncing boat. The din of gunfire was deafening, and the first thing I vividly remember was a little sergeant with a Brooklyn accent. He was standing on the beach, and he said to me with a grin, "Boy, we made it." Out of all things, he handed me a cigar. The stunned Germans defending the beach were being gathered in, and I remember their tall, blond Nazi captain. Dressed immaculately, he was, and as arrogant as ever. He refused to lie down with the rest of his men, although German shellfire was hitting the beach, and when my colleague Bob Landry of Life magazine tried to take his picture, the Nazi officer turned his back on him and on the whole American landing with deepest scorn. A few minutes later a German shell hit the beach, and the German captain went down forever. He was killed by his own shellfire. The colonel of the regiment quickly made contact with his men and led them off the beach across the green watery wastes of the port of Carteret in the rear. We followed them—long, soaking lines of men armed to the teeth. The first tank that tried to cross was hit by a German antitank shell. The second American tank fired one shot at the German antitank gun and silenced it. We were on our way. In ten minutes I had reached the position of the German gun. It was trained perfectly on the only road by which we could cross. But that first shell had panicked the German gunner, and he had fled leaving his gun perfect condition. I looked back at the beach from his observation post. With just that one gun he could have held us up on that single road crossing the swamp for hours. Now I could see other German cells docking and pulling up sand on the beach in back of us. And landing craft was going skyward as they hit underwater mines. But I was already inland, and I was glad I had chosen an early landing before the enemy had time to recover from the bombings, the shellings, and his surprise. The colonel kept pushing ahead—gathering his men, advancing his command post, and sending out the code to wipe out the machine gun nest that harassed us from time to time. By mid-afternoon, Bob Landry and I were already in the little town of Sainte-Marie-du-Mont some three miles inland. Here we met the paratroops. They were fighting a steep battle with the Germans. While I watched one paratrooper in hand-to-hand combat with a German, a shot rang out from a church steeple, and both the paratrooper and the German fell together—killed by a German bullet from that church. Other paratroopers immediately turned their attention to the church steeple, tossing grenades as high as they could. And meantime, a Frenchwoman doctor refused to take cover and was giving a wounded paratrooper morphine as he lay wrapped up in his red parachute on the village green. Whenever the machine guns opened up or a grenade exploded, the French people of the town would run for cover. And as soon as it stopped, they would emerge again. It was a most confusing scene—like a Hollywood movie set, only the dead men littering the streets made it appear real. It was glowing dusk by this time, and we decided to set down on the grass for the night. Nobody had bedrolls or blankets, but we were wildly excited over the success of the Second Front. As it hit dusk, the planes from England started to come in towing gliders. They put down in fields all around us—meeting us, murderous ground fire from the Germans who seemed to be all around us judging by the screams of color tracers that went up to meet the gliders. And then I talked to the soldier next to me. He was a youngster from South Carolina, and he'd been carrying a flamethrower all day long. He allowed as to how he was tired and his legs hurt him. I rolled up his pants, and I saw a wicked shrapnel wound in his leg. He had walked all day long with it, and never complained. Those were the American soldiers on D-Day. And this is Larry LeSueur returning you now to New York. BILL DOWNS: I have just returned from another one of those "little wars"—an isolated battle which is becoming more and more common in this ever-growing struggle for Europe. This little war in no way ranks in importance with the American drive across the Cherbourg Peninsula. Everyone on the British-Canadian sector of the front regards the cutting of the peninsula the most important single achievement since the Allied troops crossed the beaches of Normandy. But the Battle of the Hindenburg and Bleecker bastions in which I participated is the perfect example of the type of fighting that is going to occur more and more as our armies advance. I was with the Royal Marine Commandos which took these two strong points. I didn't intend to go with the commandos—it just happened that way. We haven't been able to tell you before, but just west of the city of Caen, a group of Germans has been holding out for the past ten days in two very strong defense points. These strong points, about one hundred yards apart, were built along the lines of a miniature Maginot Line. They were dug twelve feet into the ground, filled with reinforced concrete with walls three feet thick, and several medium artillery guns. The whole position was set on a rise of ground surrounded by mine fields and an intricate trench system. The Germans were so proud of these defenses that they printed the names "Hindenburg" on one of the super pillboxes and "Bleecker" on the other. The Hindenburg and Bleecker bastions were so strong that it was decided to bypass them on D-Day, and let this group of Nazis stew in their own juice. There was no hurry—the Germans couldn't do much damage there. They were completely isolated and could be cleaned out at will. Yesterday, the order came to blast them out. The strange thing about this battle was that to get there, you merely turned off a busy Allied supply route jammed with trucks. You drove a block up another road, parked your Jeep up behind the hedge, and on the other side of the hedge was the war. For half an hour, artillery whistled over our heads, bursting all over the Nazi island of resistance. Direct hits sent bits of masonry high into the air—dust from the bursting shells mixed with the black smoke of exploding mines and a burning gasoline dump to darken the sun. We were only some two hundred yards from where the shells were landing, and you had an uncontrollable tendency to duck your head just a little every time a shell came over. The artillery punctuated the barrage with shrapnel shells that burst in the air downward into the trenches. Then the barrage stopped and the tanks moved in. There were a dozen of them approaching from two directions. They crawled forward, their machine guns and heavy guns ripping into the super pillbox. Behind them moved the commandos. I was watching the battle with Richard McMillan of the United Press. When the tanks moved in, we couldn't see very much so we decided to walk up behind the nearest one and have a look. Out of the embrasures of the two bastions, heavy German machine guns fired in our direction. We clamped down in the tall wheat, but no matter how low you got you still felt as if you were sticking up as high as the Empire State Building. The funny thing about it was that we weren't particularly frightened. We were too excited to be afraid. McMillan, the British conducting officer, and myself were tremendously surprised to find ourselves in with the commandos. We had followed their attacks so closely that we had actually got caught up in the middle of it. Up ahead, an assault engineer climbed on top of the Hindenburg bastion and placed a charge of explosives on it. As soon as he lit the fuse he ran like the very devil. We all ducked. The heavy explosion must have blown a hole in the top of the pillbox. Other commandos crept up to this hole and tossed in hand grenades. One explosion set the whole works off. Out of the hole came a German "potato masher" grenade. It was on fire. We ducked again, but it didn't go off. By this time we had reached the trench system. On both sides of us men were going along the trenches with their Tommy guns. A tank assaulted one of the trenches and behind it was a young radio operator calmly chewing a stalk of wheat, waiting to flash the words that the bastion had been taken. Shouts of "come on out of there you Nazi so-and-sos" and "keep your hands up you such-and-such" announced the arrival of the 1st Troop. Then they began to pop up like prairie dogs. All told, there were between a hundred and fifty and two hundred of them. For the number of them, the Nazis resisted surprisingly weakly. It took only two squadrons of commandos to dig them out. The tanks merely stood by and watched after they had escorted these troops into position. We lined them up; they were as shaken a group of men as I've ever seen. There were all shapes and sizes of Nazis. Big ones, little ones, old, and young. But the most surprising discovery made was a large number of ordinary chicken's eggs in the bastion. The surprise was that these eggs were fresh. We could not confirm earlier reports that the Germans had women in the strong point with them. There also was plenty of food, and we shared a bottle of brandy with the victorious commandos. It was a glorious feeling being in on a success like that. But even so, I believe it's the last time that I want to be that close to a practicing commando in action. This is Bill Downs in Normandy, returning you to the United States.